Smarty Pants is Georgetown’s neighborhood hang-out, serving the best grilled sandwiches west of the Windy City. They are good - scratch-made good. 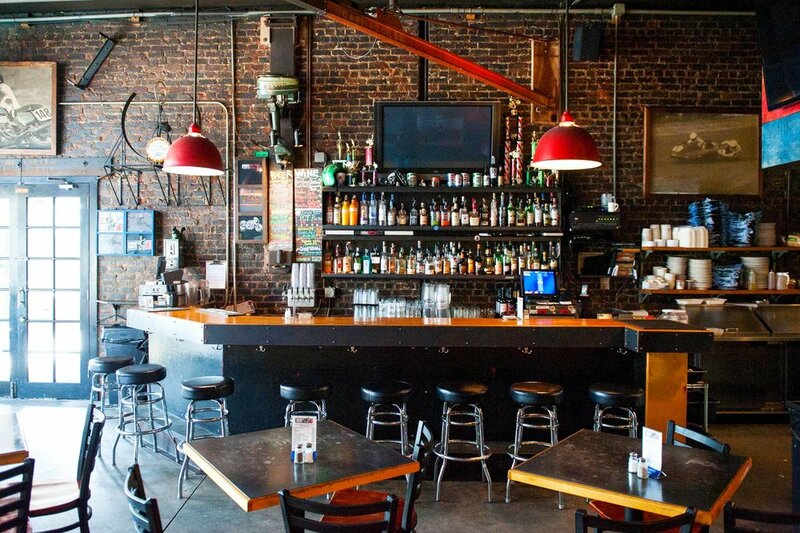 We serve simple food, with attitude, to the local color of one of the oldest neighborhoods in Seattle. Six rotating taps of locally brewed beers are thoughtfully selected by our beer guru and available alongside a great list of cocktails. We like to think that we have the best happy hour in Georgetown. Let us know what you think. In addition to the sandwiches, we make homemade soups, chili, a variety of salads, and dressings daily. We also can make any of our selections vegetarian or vegan with locally-made Field Roast, a fresh and natural grain meat. You will notice our love of motorsports when you walk through the door. We are huge fans of vintage and sport bikes of all kinds. 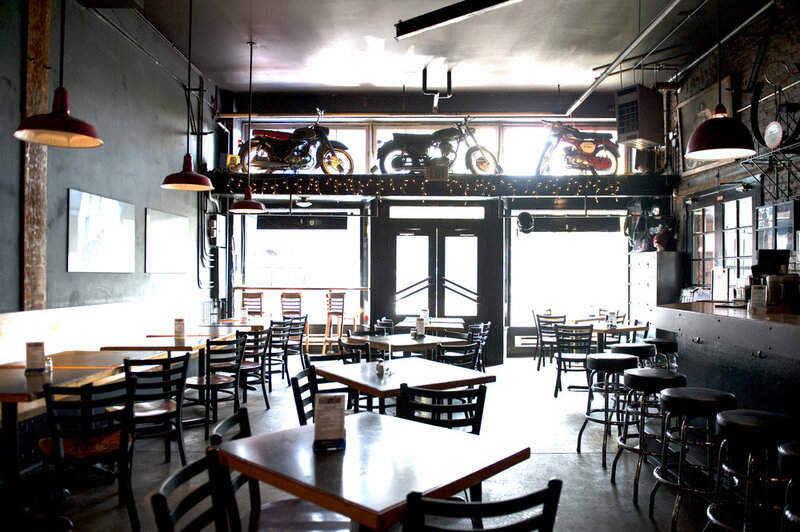 Join us for Bike Night every Wednesday featuring motorcycle races and shows on the big screen. Sorry, we don't allow furry friends on the patio in Georgetown. Marinated and slow roasted chicken breast shredded and topped with provolone, giardiniera, lettuce and mayo. Served on a french roll. Sliced chicken breast grilled with onion, monterey jack cheese and bacon. Served on a toasted french roll then topped with lettuce, tomato and Trouble sauce. Field Roast grilled with onions and vinaigrette on a french roll with our house made giardinera, shredded lettuce, oil and vinegar. Slow roasted succulent pork and grilled onions topped with slaw, monterey jack cheese and our BBQ sauce. Served on a toasted french roll. 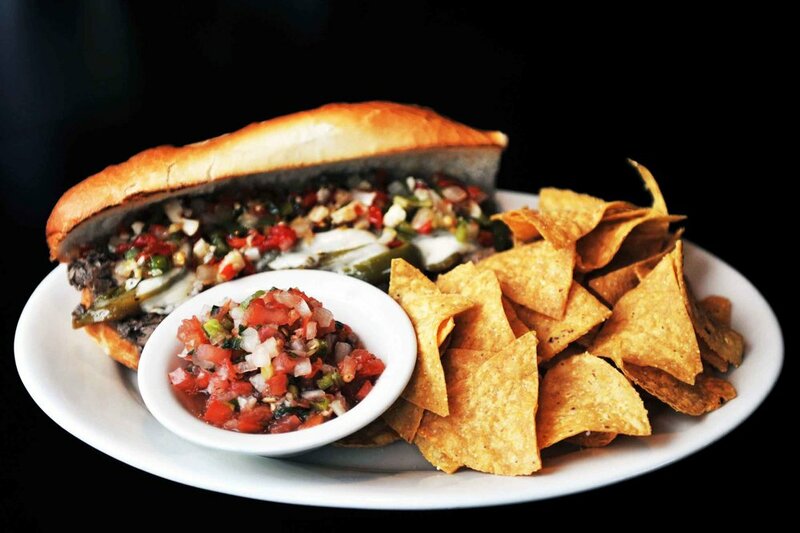 Thinly sliced, perfectly seasoned house-roasted beef served on a french roll and topped with sweet peppers, giardiniera and juice. With turkey, corned beef or Field Roast. 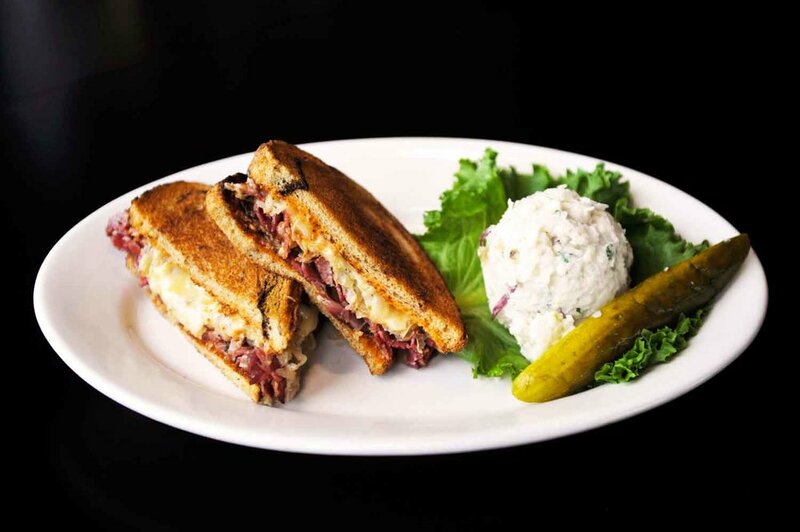 A classic reuben with your choice of meat sliced thin, topped with kraut, swiss cheese and our classic sauce. Grilled to perfection on marble rye. Grilled turkey with our own avocado spread, monterey jack cheese, lettuce, tomato, onion and mayo. Served on a toasted french roll. A generous portion of coppa, genoa salami, ham and provolone cheese topped with lettuce, oil & vin, oregano, mayo and giardiniera. Served on a toasted french roll. Rich house roasted beef or chicken breast grilled with onions, green peppers and swiss cheese. Served on a toasted french roll with our horseradish sauce. Lean ham grilled with swiss cheese. Served on a toasted french roll then topped with lettuce, tomato, mayo and onion. Turkey, bacon, lettuce, tomato and cheddar piled high on three slices of toasted sourdough with mayo and avocado spread. Savory ham, smoked bacon and swiss cheese topped with a tangy vinaigrette, lettuce, tomato and peperoncini. Served on a toasted french roll with mayo. Sliced chicken breast grilled with BBQ sauce then topped with monterey jack cheese, red onion and bacon. Served on a toasted french roll. Avocado spread, monterey jack and cheddar cheeses, red onion and tomato. Grilled on sourdough. A toasted french roll envelopes all your favorite veggies! Served with lettuce, tomato, avocado spread, onion, cucumber, monterey jack cheese and hummus. Thinly sliced turkey breast grilled with swiss cheese. Served on a toasted french roll with lettuce, onion, tomato and mayo. 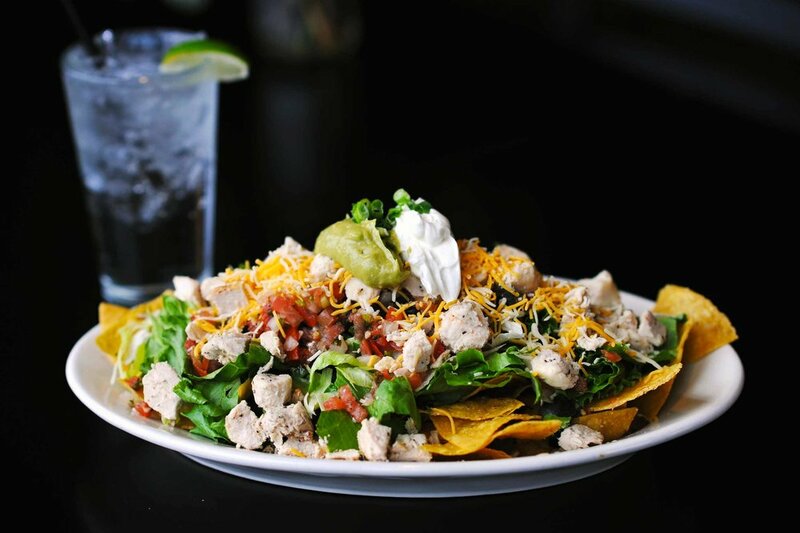 Our succulent slow-roasted pork topped with fresh lime juice, lettuce and tomato. Put to bed on a grilled french roll with mayo. Thinly sliced house roasted beef and swiss cheese grilled and topped with our horseradish sauce. Served on a toasted french roll with homemade au jus. Our homemade tuna salad with mayo, tomato and cheddar cheese. Grilled to perfection on sourdough. An American classic. Bacon, lettuce and tomato topped with sliced hard-boiled egg. Served on toasted sourdough with mayo. + All sandwiches come with your choice of potato salad, chips and salsa or slaw and a pickle. Sub green salad 2.00, soup 2.50 or chili 2.75. + Sub vegetarian Field Roast on any sandwich. Need we say anything more? Yes. We make our salsa FRESH daily! Salsa, cheese, sour cream, jalapeños ... the works! Fresh homemade hummus, toasted pita bread, cucumber, tomato, peperoncini and red onion. 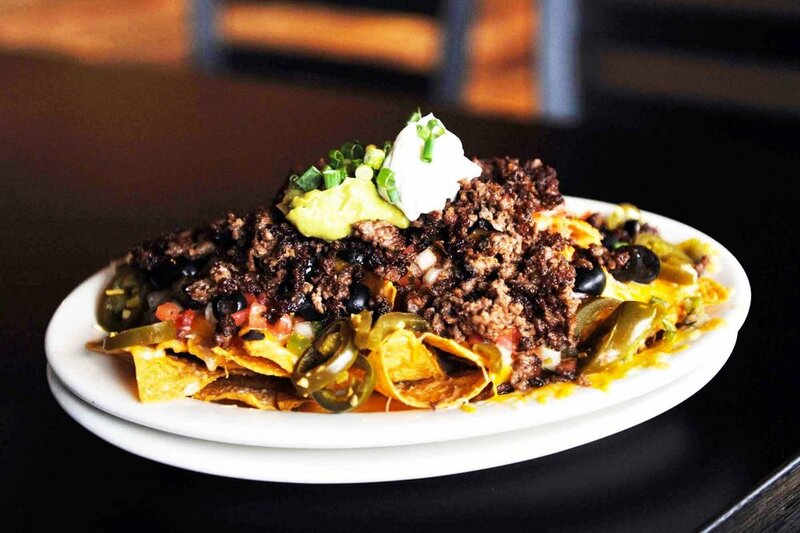 A healthy portion of corn chips topped with melted cheese, black olives, sour cream, jalapeños, salsa and avocado spread. Add chicken, pork, carne asada or Field Roast for 2.95. A meal sized serving of our meat or veggie chili atop a bed of Fritos. Finished with green onion, cheddar cheese, jalapeños and sour cream. Dee-lish! Said to be the best this side of the Duwamish. Served with green onion and grated cheddar cheese. Our soup is made fresh daily! Mixed greens with red cabbage, carrot, tomato, cucumber and croutons. Tossed in the dressing of your choice. Mixed greens tossed with chunks of chicken, bacon, gorgonzola cheese, red cabbage, macaroni, green onion, tomato and our Tiptop dressing. 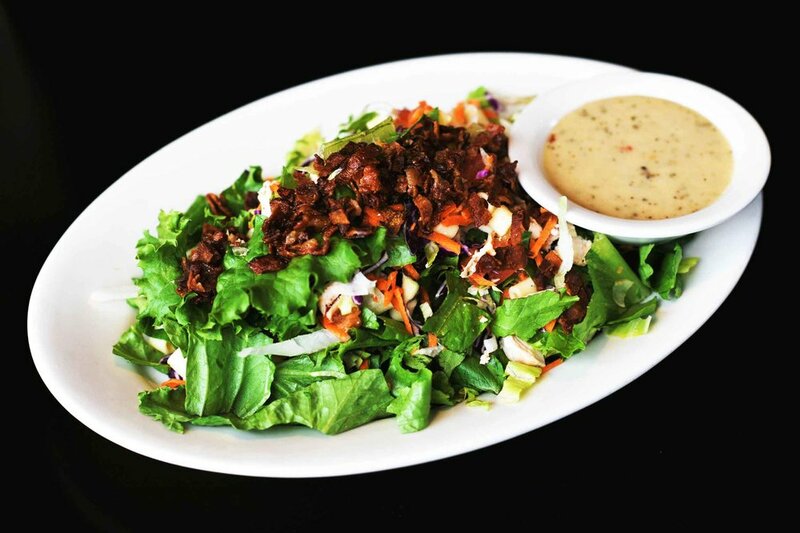 Mixed greens, red cabbage, carrot, tomato, croutons and macaroni tossed in your choice of dressing. Topped with swiss and cheddar cheese, hardboiled egg, and your choice of grilled chicken or roast beef. Mixed greens tossed with parmesan cheese, grilled chicken, garlic croutons and our zesty Caesar dressing. + DRESSINGS: Blue Cheese, 1000 Island, Italian, Caesar, Ranch, Tiptop, Go Juice, or Loco. Gluten free! Quinoa, mixed greens, red cabbage, carrot, tomato, avocado spread, green onion, cilantro and queso fresco. With our Go Juice Vinaigrette. Gluten free! Quinoa, mixed greens, red cabbage, garbanzo beans, red onion, black olive and giardinera. With zesty Italian vinaigrette. Served with hash browns, baked beans and toast. Add bacon or ham for 3.00. One egg scrambled or fried topped with cheddar, tomato and trouble sauce on a toasted English muffin. Add bacon, ham or spinach for 2.00. Turkey, ham and swiss cheese on french toast with a fried egg. Served with hash browns. A bed of veggie or meat chili topped with three scrambled eggs, cheese, sour cream and jalapeños. Served with hash browns and toast. Two homemade buttermilk biscuits topped with our scratch made mushroom gravy and two eggs. Savory house-cured and roasted corned beef with garlic, onion, peppers, potatoes and two eggs. Served with toast. Scrambled eggs with corn tortilla chips, cheese and salsa. Topped with sour cream and green onions and served with hash browns. Split English muffin topped with ham, poached eggs and hollandaise. Served with hash browns. Grilled chicken with onions, bacon and jack cheese on a bed of scrambled eggs. Served with a side of hash browns and trouble… sauce that is! A classic! Two eggs fried in the center of toast. Served with hash browns and beans. Two eggs any style, carne asada, homemade salsa verde and corn tortillas topped with sour cream, red onion and queso fresco. Split English muffin topped with spinach, tomato, poached eggs and hollandaise. Served with hash browns. + All omelettes are served with hash browns and toast. Three eggs, sausage, spinach, onion, mushroom, tomato and parmesan cheese. Three eggs, ham or Field Roast Apple Maple, onions, garlic and bell peppers topped with cheese. Three eggs, sausage, ham, bacon and cheese topped with sour cream and green onion. Three eggs, our homemade breakfast sausage, onions and mushrooms. Topped with parmesan. Three eggs, Field Roast Mexican Chipotle sausage, tomatoes and onions. Topped with queso fresco and green onions. + All burritos are served with hash browns. A flour tortilla stuffed with scrambled eggs, cheese and black beans topped with salsa, sour cream and avocado spread. Chorizo or Field Roast Mexican Chipotle sausage ride along with scrambled eggs, cheese and salsa in a flour tortilla topped with sour cream and green onions. Spicy marinated chicken and pinto beans mix it up with scrambled eggs and cheese in a flour tortilla topped with sour cream and salsa. Carne asada, pinto beans, scrambled eggs and cheese in a flour tortilla served wet with our homemade salsa verde and topped with sour cream. * Consuming raw or undercooked meats, poultry or eggs may increase your risk of food-borne illness. Hey, we would love to hear from you. Drop us a line and tell us what you think of our restaurant! Thank you, your message has been sent! We will be in touch soon.